Jennite: Mineral information, data and localities. Named in 1966 by Alden B. Carpenter, Robert A. Chalmers, John Alan Gard, K. Speakman, and Harry Francis West Taylor in honor of U. S. A. Army Colonel Clarence Marvin Jenni [November 3, 1896 USA - November 1, 1973 Columbia, Missouri, USA], curator of the Geological Museum of the University of Missouri (1960-1967, but he remained somewhat active as a curator in retirement until his passing in 1973), Columbia, Missouri, USA, and who discovered the mineral. 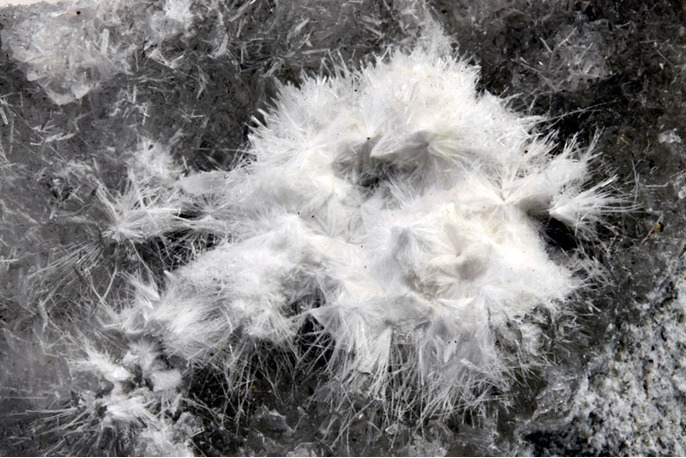 The structure of Jennite is composed of wollastonite-type dreier single chains (i.e. single chains with a repeating unit of three (SiO4) tetrahedra), ribbons of edge-sharing (CaO6) octahedra, and additional (CaO6) octahedra on inversion centers (Bonaccorsi et al., 2004). 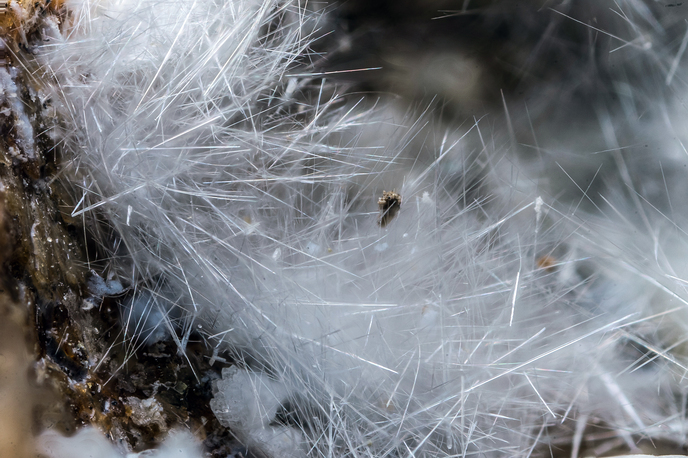 Blade shaped crystals, fibrous aggregates. Ettringite 2 photos of Jennite associated with Ettringite on mindat.org. Chabazite-Ca 2 photos of Jennite associated with Chabazite-Ca on mindat.org. Tobermorite 2 photos of Jennite associated with Tobermorite on mindat.org. Poldervaartite 1 photo of Jennite associated with Poldervaartite on mindat.org. Bultfonteinite 1 photo of Jennite associated with Bultfonteinite on mindat.org. Merwinite 1 photo of Jennite associated with Merwinite on mindat.org. Calcite 1 photo of Jennite associated with Calcite on mindat.org. Scawtite 1 photo of Jennite associated with Scawtite on mindat.org. Willhendersonite 1 photo of Jennite associated with Willhendersonite on mindat.org. Carpenter, A.B., Chalmers, R.A., Gard, J.A., Speakman, K., and Taylor, Harry Francis West (1966): Jennite, a new mineral: American Mineralogist 51, 56-74. Gard, J.A., Taylor, H.F.W., Cliff, G., and Lorimer, G.W. (1977): A reexamination of jennite. American Mineralogist 62, 365-368. Bonaccorsi, E., Merlino, S., and Taylor, H.F.W. (2004): The crystal structure of jennite, Ca9Si6O18(OH)6·8H2O. Cement and Concrete Research 34(9), 1481-1488. Müller, D., Hochleitner, R., Fehr, K.T. (2016): Raman spectroscopic investigations of natural jennite from Maroldsweisach, Bavaria, Germany. Journal of Raman Spectroscopy 47, 602-606. 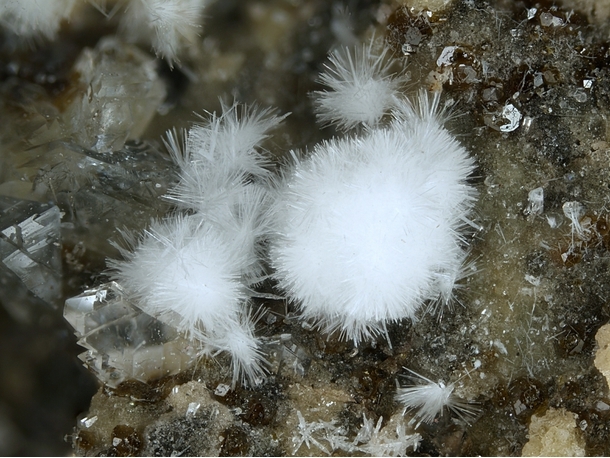 Wittern: "Mineralfundorte in Deutschland", 2001; Müller, D., Hochleitner, R., Fehr, K.T. (2016): Raman spectroscopic investigations of natural jennite from Maroldsweisach, Bavaria, Germany. Journal of Raman Spectroscopy 47, 602-606. Kusachi et al (1984) Koubutsu-Gakkai Kou'en-Youshi, 100. Mineralogical Journal Vol. 14 (1989), No. 7 pp 279-292; Henmi, C., & Kusachi, I. (1992). Clinotobermorite, Ca5Si6 (O, OH) 18· 5H2O, a new mineral from Fuka, Okayama Prefecture, Japan. Mineralogical Magazine, 56(3), 353-358. Neumann, H. (1985): Norges Mineraler. Norges geologiske Undersøkelse Skrifter 68, 278 pp. Carpenter, A.B., R.A. Chalmers, J.A. Gard, K. Speakman & H.F.W. Taylor (1966), Jennite, a new mineral: American Mineralogist: 51: 56-74; Pemberton, H. Earl (1983), Minerals of California; Van Nostrand Reinholt Press: 479.